Lacto-fermented vegetables. It sounds gross, I know. But it’s basically just another word for pickling. You shouldn’t be intimidated–it’s fun and easy! All you need to do is chop, pour, and store. Obviously, I can’t eat them. But it’s still a darling gift. So why eat lacto-fermented vegetables? These are very good for your gut, as they produce lactobacillus–a probiotic–and it’s very important for those of us with damaged guts (and non-damaged guts!) to consume probiotics. 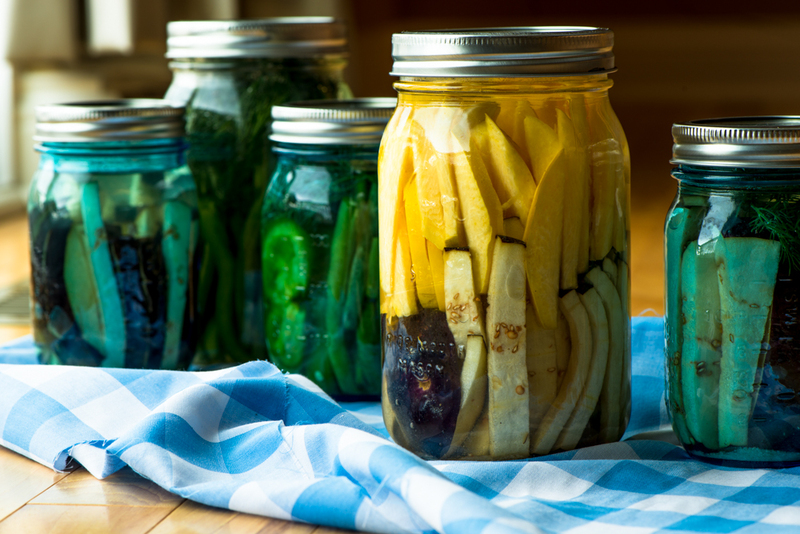 You can use just about any vegetable when you lacto-ferment, and the combinations are endless! The ones I’ve used for the pictures (knitted pickles excluded) are based on my Mediator Release Test results, and I’ve chose the least reactive vegetables: yellow squash, eggplant, green pepper, and green beans. I’ve never eaten squash or eggplant before, so that could be interesting. The recipe below is for pickled dilly beans, but the basics for any lacto-fermented vegetable are: vegetables, water, and salt. You want the water you use to be pure without sacrificing minerals, so you should avoid tap water if possible or the chlorine and fluoride that may be present could ruin your efforts. Water that has gone a through a home filter usually isn’t to be trusted, either. I’ve done a bit of research and chosen to use Mountain Valley Spring Water, which is free of chlorine and fluoride but still contains minerals. And it comes in a glass bottle. My runner-up choice is Evian. Recently I’ve started using this pink sea salt. The salts we buy at the market (including most sea salts you get at health food stores) are highly refined and in that process the valuable trace minerals salt contains are destroyed and harmful chemicals are used to keep it dry and white. Salt that is dried naturally (i.e. by the sun) is the way to go. Wash the green beans and green pepper. De-seed and chop the green pepper into thin slices. Cut off the ends of the green beans. 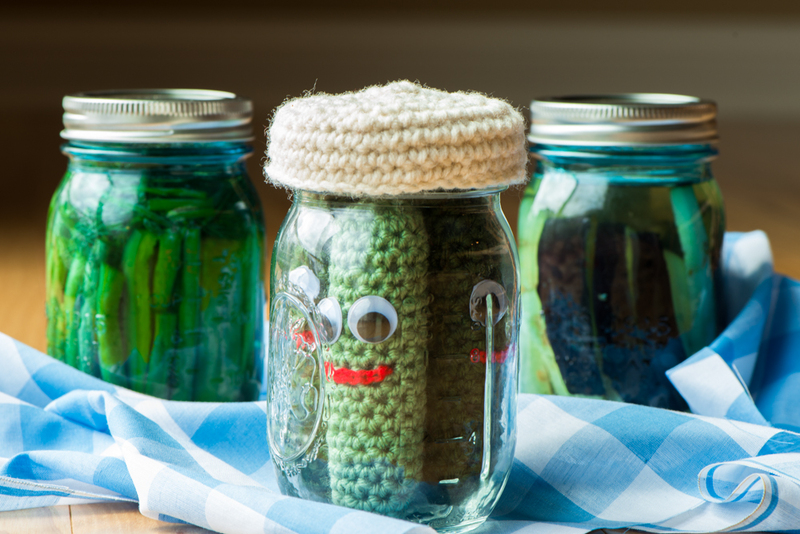 If using a pint-size mason jar, you might have to cut some beans in half. Peel and crush the garlic clove(s). Lay a jar on its side and add in the vegetables and garlic clove(s). Make sure they’re packed in tightly or they will float to the top and the brine won’t cover them. Add dill on top of the beans. Add in 1 tablespoon of salt for a quart jar, and 1/2 tablespoon for a pint. Pour in the water until it’s about 1 inch away from the top of the jar. Screw the cap on the jar tightly and store in a dark place, like a cupboard. The time to let it ferment varies from a few hours to a few weeks. I like to let mine go about 3 days and then stick them in the fridge to slow down the fermentation. I eat a few every day before dinner to help with digestion. Elimination Diet safe: I’m actually not sure about this one. This entry was posted in Recipes and tagged dairy free, FODMAP, fructose malabsorption, gluten free, vegetables by nosugarlessgum. Bookmark the permalink. You are welcome! I also read a tip while I was doing my research on this technique, and that person said they sometimes put a small glass bowl on the top of everything to keep things under the brine. Haha, I did that, too. Maybe it wasn’t expensive enough… or I’m just bad at making sauerkraut. 😛 I’ve heard of Pickle-it jars but it seems a silly expense for something I don’t eat every day. Maybe I’ll just keep getting it from the supermarket. Ugh, I meant heavy enough, not expensive enough. How is the mediator release test result diet working for you? Wondering if I should have this done or not. Any insight would be greatly appreciatated. If you’ve been doing an elimination diet and things haven’t been working I would highly recommend this test. I’m still trying to figure a few things out (which is why I haven’t written an update post on it) but I’m very pleased with the results it has brought me. If you get it done I would love to know how it turns out for you!